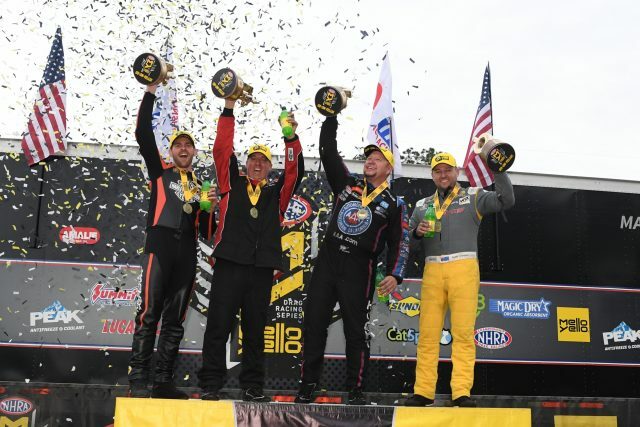 GAINESVILLE, FLA. – Top Fuel pilot Richie Crampton secured back-to-back event victories Sunday at the 50th annual Amalie Motor Oil NHRA Gatornationals at Gainesville Raceway. 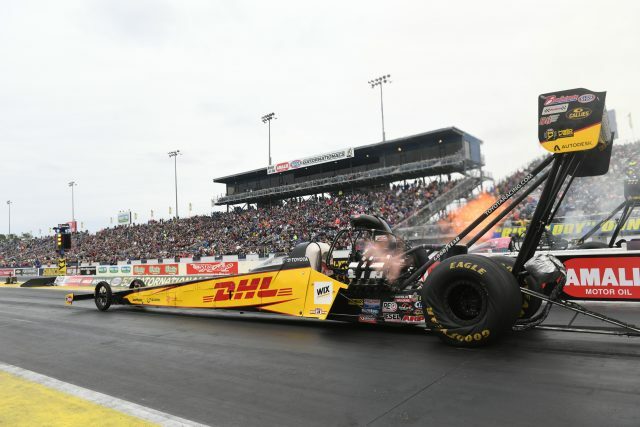 Crampton locked in his first victory since this event last year on a holeshot win against Clay Millican with his pass of 3.769-seconds at 329.89 mph in his DHL / Kalitta Air dragster. He had not won a round this season, prior to securing his ninth career win. Hight claimed the Funny Car title with his run of 3.867 at 331.61 in his Auto Club of Southern California Chevrolet Camaro SS to defeat Tim Wilkerson in the finals. After earning his third No. 1 qualifier of the season on Saturday, Hight secured his second Wally of the season and 47th of his career. 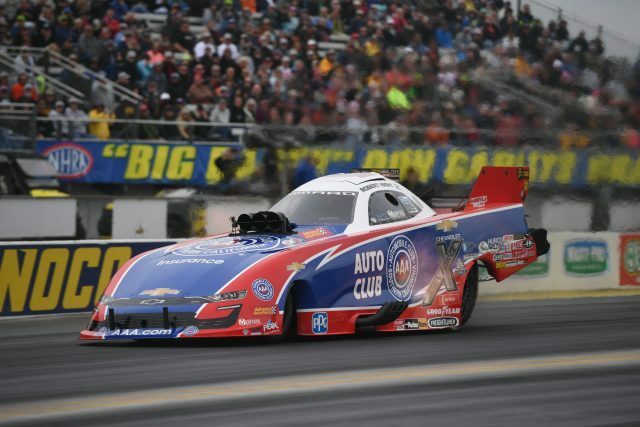 Hight raced against Terry Haddock, Ron Capps and John Force before entering his second final round of the season. 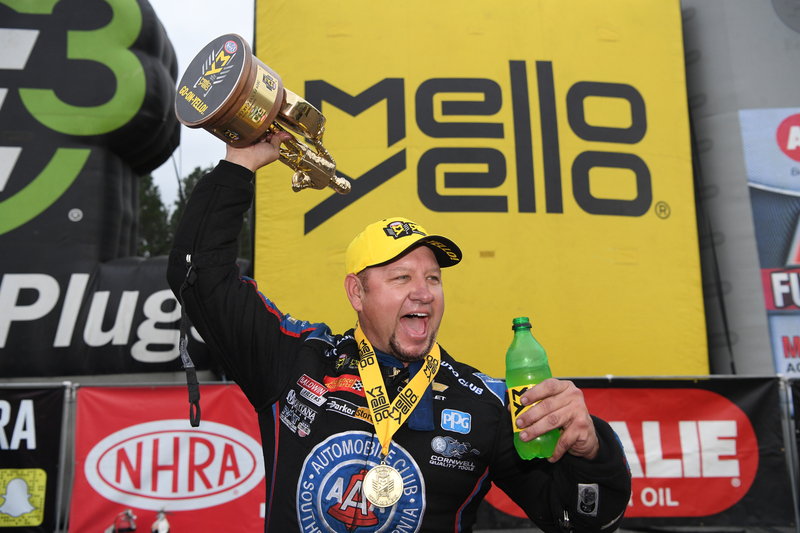 Wilkerson took down Dave Richards, Cruz Pedregon and defending event winner Jack Beckman. 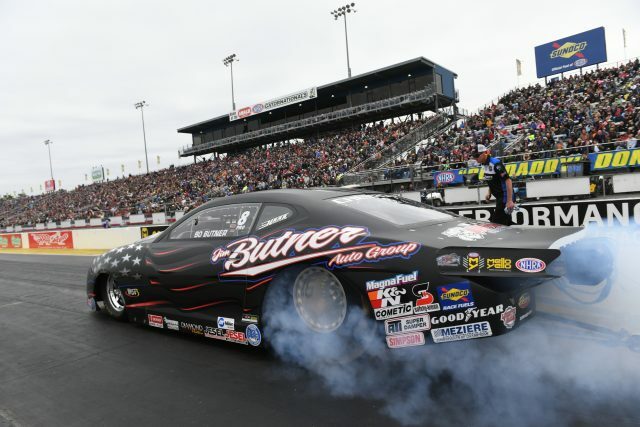 In Pro Stock, 2017 world champion Butner powered his Jim Butner’s Auto Chevrolet Camaro to victory with a run of 6.505 at 212.29 over Alex Laughlin. Butner was the runner-up at this facility last year and clinched his second win of the season. His fiance, Randi Lyn Shipp, won in the Stock Eliminator category at this event. Butner qualified in the No. 5 position and defeated Fernando Cuadro, Deric Kramer and No. 1 qualifier Rodger Brogdon who red-lit in the semi-finals. Laughlin bested veterans Jason Line, Greg Anderson and Kenny Delco before facing Butner. 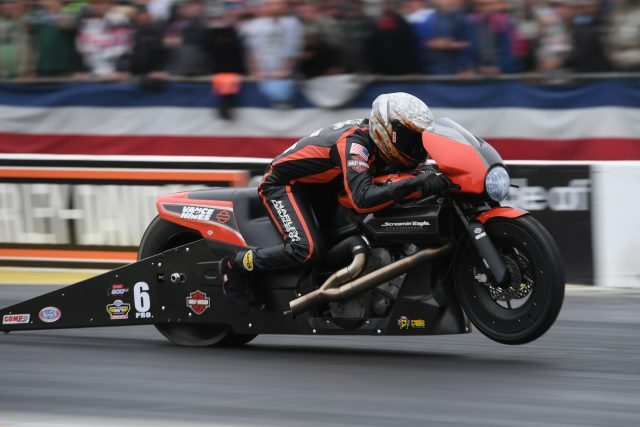 Hines raced to his first win in the category since Pomona 2 2017 with a run of 6.752 at 199.17 on his Screamin’ Eagle Vance and Hines Harley-Davidson Street Rod. He defeated his teammate and defending event winner Eddie Krawiec for a rematch of the finals from 2018. Krawiec was the No. 1 qualifier for the event and secured his 49th career victory. Krawiec was the No. 2 qualifier for the event and defeated Scott Pollacheck, Jim Underdahl and Joey Gladstone en route to his fourth consecutive final round at this facility. 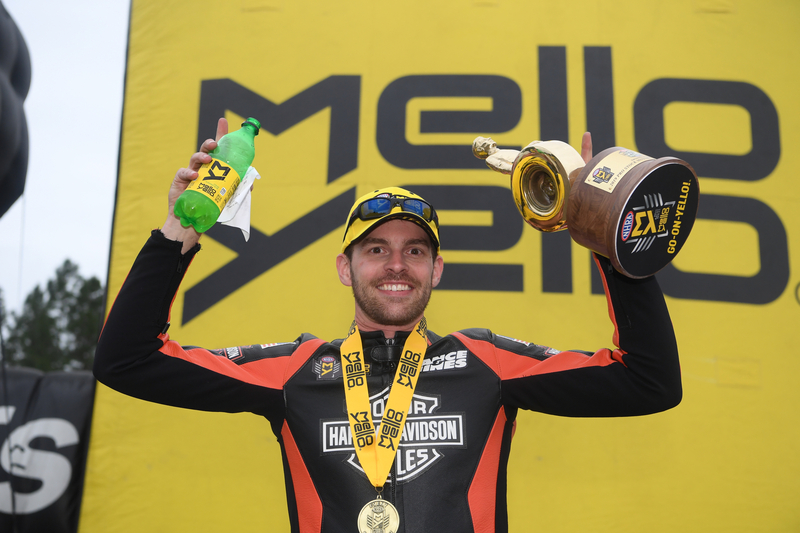 The 2019 NHRA Mello Yello Drag Racing Series season continues with the DENSO Spark Plugs NHRA Four-Wide Nationals at The Strip at Las Vegas Motor Speedway April 5-7 in Las Vegas. GAINESVILLE, Fla. — Final finish order (1-16) at the 50th annual Amalie Motor Oil NHRA Gatornationals at Gainesville Raceway. 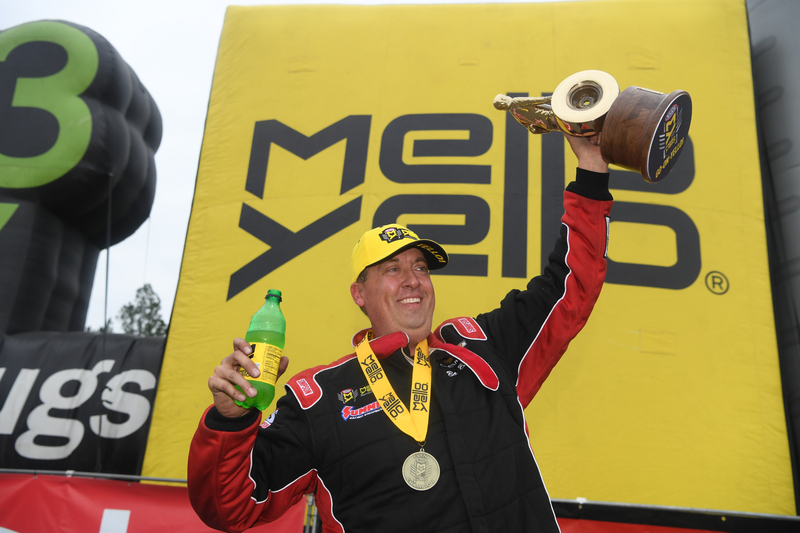 The race is the third of 24 events in the NHRA Mello Yello Drag Racing Series. Richie Crampton; 2. Clay Millican; 3. T.J. Zizzo; 4. Doug Kalitta; 5. Steve Torrence; 6. Leah Pritchett; 7. Brittany Force; 8. Jordan Vandergriff; 9. Terry McMillen; 10. Dom Lagana; 11. Mike Salinas; 12. Austin Prock; 13. Antron Brown; 14. Scott Palmer; 15. Pat Dakin; 16. Chris Karamesines. Robert Hight; 2. Tim Wilkerson; 3. John Force; 4. Jack Beckman; 5. Tommy Johnson Jr.; 6. Cruz Pedregon; 7. Matt Hagan; 8. Ron Capps; 9. Jonnie Lindberg; 10. Shawn Langdon; 11. Bob Tasca III; 12. Terry Haddock; 13. J.R. Todd; 14. Dave Richards; 15. John Smith; 16. Jim Campbell. Bo Butner; 2. Alex Laughlin; 3. Kenny Delco; 4. Rodger Brogdon; 5. Greg Anderson; 6. Shane Tucker; 7. Chris McGaha; 8. Deric Kramer; 9. Jeg Coughlin; 10. Jason Line; 11. Fernando Cuadra; 12. Matt Hartford; 13. Alan Prusiensky; 14. Wally Stroupe; 15. Erica Enders; 16. Val Smeland. Andrew Hines; 2. Eddie Krawiec; 3. Hector Arana Jr; 4. Joey Gladstone; 5. Ryan Oehler; 6. Jerry Savoie; 7. Jim Underdahl; 8. Matt Smith; 9. Angie Smith; 10. Cory Reed; 11. Angelle Sampey; 12. Karen Stoffer; 13. Kelly Clontz; 14. Scotty Pollacheck; 15. Hector Arana; 16. Melissa Surber. 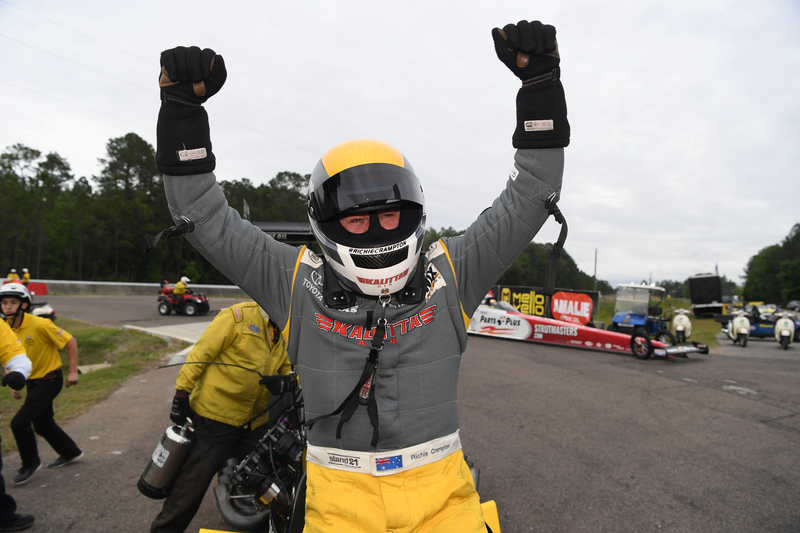 Top Fuel — Richie Crampton, 3.769 seconds, 323.89 mph def. Clay Millican, 3.756 seconds, 324.67 mph. Funny Car — Robert Hight, Chevy Camaro, 3.867, 331.61 def. Tim Wilkerson, Ford Mustang, 11.165, 92.63. Pro Stock — Bo Butner, Chevy Camaro, 6.505, 212.29 def. Alex Laughlin, Camaro, Broke. Pro Stock Motorcycle — Andrew Hines, Harley-Davidson, 6.752, 199.17 def. Eddie Krawiec, Harley-Davidson, 6.762, 198.90. Top Alcohol Dragster — Megan Meyer, 5.201, 285.35 def. Mike Bucher, 7.301, 122.56. Top Alcohol Funny Car — Sean Bellemeur, Chevy Camaro, 5.352, 273.27 def. Doug Gordon, Camaro, 5.469, 266.21. Top Fuel Harley — Beau Layne, Weekend, 6.473, 217.42 def. Bob Malloy, Buell, 7.247, 187.96. Factory Stock Showdown — Drew Skillman, Ford Mustang, 7.736, 176.70 def. Stephen Bell, Chevy Camaro, 7.887, 176.33. Competition Eliminator — Craig Bourgeois, Dragster, 6.820, 184.77 def. Randy Daniels, Sunfire, 8.297, 161.65. Super Stock — Kevin Riner, Chevy Camaro, 10.278, 124.96 def. Mark Alvey, Camaro, 10.055, 126.10. Stock Eliminator — Randi Lyn Shipp, Pontiac Firebird, 10.517, 118.96 def. Eddie Longhany Jr, Chevy Camaro, 10.223, 128.21. Super Comp — Holden Laris, Dragster, 8.941, 181.18 def. Nichole Stephenson, Dragster, 8.926, 179.49. Super Gas — Ed Richardson, Chevy Cutlass, 9.898, 166.83 def. Carl Watts, Chevy Cavalier, 9.871, 164.87. Super Street — Doug Ramsey, Chevy Camaro, 10.905, 145.75 def. Colby Fuller, Camaro, 10.927, 135.56. Top Dragster presented by RacingRVs.com — Anthony Bertozzi, Dragster, 10.972, 81.76 def. Steve Furr, Dragster, Foul – Red Light. Top Sportsman presented by RacingRVs.com — Sandy Wilkins, Chevy Camaro, 6.655, 193.71 def. Bruce Thrift, Pontiac GTO, 6.620, 207.59. ROUND ONE — T.J. Zizzo, 4.467, 287.84 def. Scott Palmer, 7.510, 92.54; Clay Millican, 3.713, 325.61 def. Austin Prock, 3.996, 311.63; Richie Crampton, 3.783, 318.77 def. Antron Brown, 4.376, 220.40; Brittany Force, 3.712, 304.12 def. Chris Karamesines, 8.179, 68.29; Jordan Vandergriff, 3.721, 322.34 def. Mike Salinas, 3.986, 275.28; Steve Torrence, 3.680, 327.27 def. Dom Lagana, 3.845, 264.18; Leah Pritchett, 3.724, 327.59 def. Pat Dakin, 7.999, 80.28; Doug Kalitta, 3.749, 325.30 def. Terry McMillen, 3.749, 325.22; QUARTERFINALS — Crampton, 3.785, 319.37 def. Pritchett, 3.739, 328.78; Millican, 3.701, 325.69 def. Vandergriff, 10.914, 71.66; Zizzo, 3.764, 325.92 def. Force, 3.751, 326.95; Kalitta, 3.703, 327.51 def. Torrence, 3.708, 329.91; SEMIFINALS — Crampton, 3.734, 326.56 def. Zizzo, 3.844, 297.42; Millican, 3.909, 313.73 def. Kalitta, 4.920, 145.97; FINAL — Crampton, 3.769, 323.89 def. Millican, 3.756, 324.67. ROUND ONE — Tim Wilkerson, Ford Mustang, 4.759, 231.48 def. Dave Richards, Mustang, 5.240, 213.43; John Force, Chevy Camaro, 3.892, 326.63 def. Jim Campbell, Dodge Charger, 8.295, 78.64; Tommy Johnson Jr., Charger, 3.933, 326.56 def. John Smith, Charger, 5.306, 150.05; Robert Hight, Camaro, 3.869, 331.94 def. Terry Haddock, Mustang, 4.234, 284.03; Matt Hagan, Charger, 3.941, 322.58 def. Jonnie Lindberg, Mustang, 3.950, 324.44; Jack Beckman, Charger, 3.905, 326.79 def. J.R. Todd, Toyota Camry, 4.353, 255.53; Cruz Pedregon, Charger, 3.924, 325.22 def. Shawn Langdon, Camry, 3.966, 323.27; Ron Capps, Charger, 3.910, 324.59 def. Bob Tasca III, Mustang, 3.969, 316.90; QUARTERFINALS — Wilkerson, 3.872, 329.50 def. Pedregon, 8.110, 84.77; Hight, 3.870, 330.88 def. Capps, 10.137, 77.38; Force, 4.471, 185.95 def. Hagan, 9.028, 77.04; Beckman, 3.898, 329.67 def. Johnson Jr., 3.892, 327.03; SEMIFINALS — Wilkerson, 3.896, 329.02 def. Beckman, 4.211, 267.27; Hight, 3.852, 331.20 def. Force, 3.942, 324.12; FINAL — Hight, 3.867, 331.61 def. Wilkerson, 11.165, 92.63. ROUND ONE — Chris McGaha, Chevy Camaro, 6.566, 210.97 def. Erica Enders, Camaro, 6.751, 173.63; Alex Laughlin, Camaro, 6.512, 210.83 def. Jason Line, Camaro, 6.527, 212.39; Kenny Delco, Camaro, 6.533, 210.34 def. Jeg Coughlin, Camaro, 6.516, 212.53; Bo Butner, Camaro, 6.532, 212.46 def. Fernando Cuadra, Camaro, 6.549, 211.63; Shane Tucker, Camaro, 6.593, 209.26 def. Matt Hartford, Camaro, 6.571, 211.13; Greg Anderson, Camaro, 6.504, 212.69 def. Alan Prusiensky, Dodge Dart, 6.625, 208.07; Rodger Brogdon, Camaro, 6.566, 211.23 def. Wally Stroupe, Camaro, Foul – Red Light; Deric Kramer, Camaro, 6.505, 212.33 def. Val Smeland, Camaro, 12.777, 67.47; QUARTERFINALS — Brogdon, 6.513, 211.39 def. McGaha, 7.852, 127.58; Delco, 6.555, 210.01 def. Tucker, 6.610, 209.23; Butner, 6.552, 211.76 def. Kramer, 20.651, 37.89; Laughlin, 6.507, 211.00 def. Anderson, 6.506, 213.16; SEMIFINALS — Butner, 8.103, 115.58 def. Brogdon, Foul – Red Light; Laughlin, 6.531, 210.57 def. Delco, 6.550, 210.41; FINAL — Butner, 6.505, 212.29 def. Laughlin, Broke. ROUND ONE — Jerry Savoie, Suzuki, 6.916, 187.89 def. Hector Arana, 7.095, 196.93; Joey Gladstone, 6.873, 194.46 def. Angelle Sampey, Harley-Davidson, 6.884, 195.39; Ryan Oehler, Buell, 6.853, 196.36 def. Karen Stoffer, Suzuki, 6.901, 194.04; Andrew Hines, Harley-Davidson, 6.781, 198.67 def. Cory Reed, Foul – Red Light; Hector Arana Jr, 6.815, 197.62 def. Kelly Clontz, Suzuki, 6.916, 192.19; Matt Smith, 6.795, 197.36 def. Angie Smith, 6.850, 196.79; Eddie Krawiec, Harley-Davidson, 6.803, 198.17 def. Scotty Pollacheck, 6.964, 192.41; Jim Underdahl, Suzuki, Broke def. Melissa Surber, Buell, Foul – Red Light; QUARTERFINALS — Arana Jr, 6.797, 197.08 def. Oehler, 6.886, 198.44; Krawiec, 6.920, 197.68 def. Underdahl, 7.184, 153.49; Gladstone, 6.811, 194.74 def. M. Smith, Broke; Hines, 6.756, 199.14 def. Savoie, Foul – Red Light; SEMIFINALS — Krawiec, 6.819, 197.08 def. Gladstone, 6.850, 194.72; Hines, 6.758, 199.08 def. Arana Jr, Foul – Red Light; FINAL — Hines, 6.752, 199.17 def. Krawiec, 6.762, 198.90. Doug Kalitta, 246; 2. Leah Pritchett, 204; 3. Steve Torrence, 197; 4. (tie) Richie Crampton, 178; Billy Torrence, 178; 6. Terry McMillen, 166; 7. Mike Salinas, 161; 8. Clay Millican, 157; 9. Antron Brown, 150; 10. Austin Prock, 138. Robert Hight, 330; 2. Jack Beckman, 225; 3. Matt Hagan, 215; 4. John Force, 200; 5. Tommy Johnson Jr., 191; 6. Tim Wilkerson, 165; 7. Bob Tasca III, 163; 8. J.R. Todd, 159; 9. Ron Capps, 146; 10. Shawn Langdon, 143. Bo Butner, 301; 2. Alex Laughlin, 229; 3. Jason Line, 189; 4. Erica Enders, 186; 5. Matt Hartford, 185; 6. Rodger Brogdon, 184; 7. Jeg Coughlin, 180; 8. Deric Kramer, 166; 9. Kenny Delco, 141; 10. Chris McGaha, 137. Andrew Hines, 124; 2. Eddie Krawiec, 106; 3. Hector Arana Jr, 76; 4. Joey Gladstone, 72; 5. Matt Smith, 63; 6. Ryan Oehler, 54; 7. (tie) Jerry Savoie, 53; Jim Underdahl, 53; 9. Angelle Sampey, 35; 10. (tie) Hector Arana, 32; Karen Stoffer, 32; Melissa Surber, 32.